Today was first the day I could request my return flight for next summer. I made the call to BMI Diamond Club and spoke to someone who was unusually helpful and pretty efficient and offered to put the me on the waiting list without me needing to ask. There were no seats immediately available (quite possibly because I’ve been too eager and they’re not in the system yet) so my request has been passed on to the relevant department to see if they will make a redemption booking for me anyway. Let’s hope so – the whole point of going mental getting enough flyer miles for Gold status was to ensure I’d be able to get those lovely flat bed business class seats using my miles during peak times. Claire and I had joked about not needing to rent a house next summer with all the comps we’d racked up between us, but it’s almost a reality. Check this out. All four midweek periods have five-night comps showing at Harrah’s, Paris or Flamingo. Or all three. 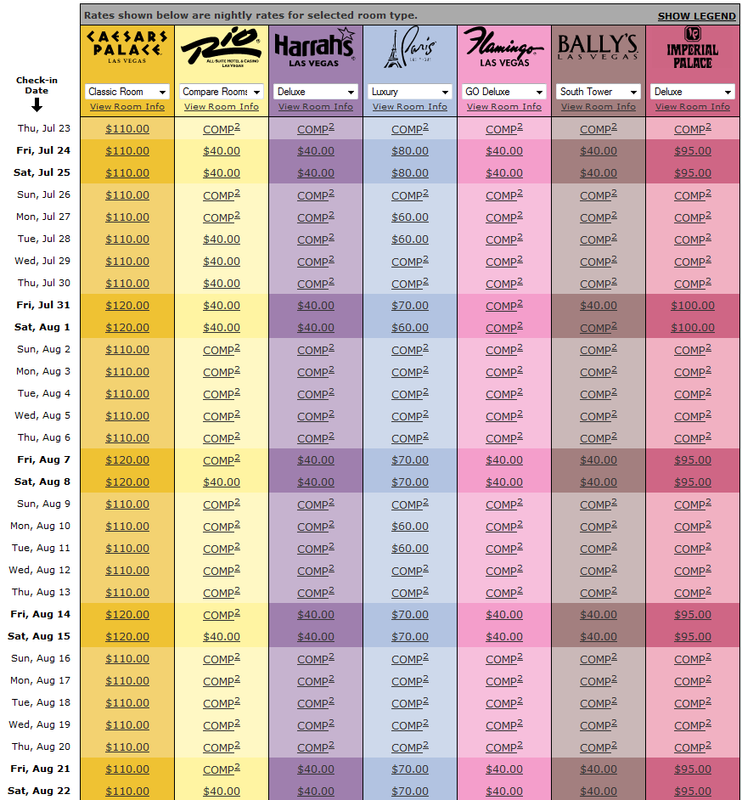 Chances are Bally’s and Imperial Palace will come available soon too – looks like it only has booking data in the system until the end of July so far. Only Friday and Saturday nights would cost money, and even if Imperial Palace doesn’t step up to save the day with a free Luv Tub room every weekend (it’s already available for the first one) we could probably get by with other room offers from Casino Royale and Four Queens. Whether or not I’m game enough to spend four straight weeks in casino hotels is another matter. That’s the whole point in staying away from the action when we go for the summer, so there is somewhere to escape to. Plus, not having the option to cook (read: bung some hot pockets in the microwave) would make eating a whole lot more expensive, and that’s pretty significant for a long vacation. Not to mention getting fleeced $11.99/day for internet, times 30 days. There’s no major rush to decide mind. It’s still T minus like three hundred and something. Often the room types are wrong, try changing the room type and you will show that other properties are comped too, just not that particular room. I’d selected what I’ve found to be the most available room type at each hotel in the picture above. Imperial Palace is a funny one because sometimes Capri rooms aren’t available as comp but Luv Tub is. Otherwise it generally seems to be one room type per hotel that has the best deals. There’s also the possibility of a free upgrade when you check in anyway. I believe you get upgraded with a Diamond card whether or not you pay for the room, if one is available. For example, I booked a “Deluxe” room at Flamingo and ended up in a “Go” room with Strip view (which I have never seen listed as a comp). I think the Rio suite I had in June was upgraded too as the description online says “mountain view” and I got a great Strip view!